Highly versatile free standing FS DC 180° inverter with dual clamps. The FS DC Inverter can be loaded by forklift truck or at ground level by pallet truck with either ramped access or flush to floor tables. All FS DC Inverter machines are painted with two coats of zinc primer and a 2 pack epoxy acrylic top coat as standard. 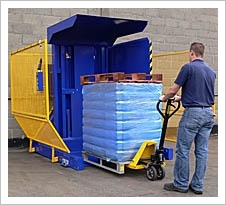 The standard unit handles loads up to 2 metres and down to as low as 600mm in height while the loading capacity is 2000Kgs. stainless steel, hot zinc spray or “Steel-It” finish available. Usable jaw opening: max 2.00m min 0.64m ramp loaded tables or 0.74m floor flush tables. Increased jaw opening models available. Controls: Extended individual push button controls with semi or fully auto- sequenced systems available as an option. Depth increases to 3.31m when fitted with floor-fixed guards and multi photo-beams. Standard shipping dimensions: 2.80m wide x 2.30m deep x 2.20m high with guards fitted.